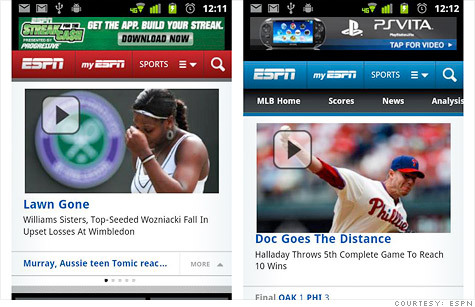 ESPN's new mobile app looks native but runs entirely on the Web. NEW YORK (CNNMoney) -- Earlier this month, the Financial Times and ESPN debuted slick new applications for smartphones and tablets. But you won't find them in the iTunes App Store or Android Market. These apps run in your browser window. That's a sea change that could reshape the app landscape. Right now, all roads to the iPhone and iPad run through Apple. The only straightforward way for users to load apps onto their Apple devices is to download the software from Apple's curated and tightly controlled app store. Things are a little looser in the Android ecosystem, where Google lets almost anything into its Android Market and Amazon runs a rival Android Appstore, but gatekeepers still stand between app developers and their customers. That's about to change, thanks to an emerging Web standard called HTML5. The new standard supports video, offline reading, touch and gestural interaction -- all functions that, until recently, were only available for mobile devices on native apps. "We actively tried to replicate what we had in our native app into our HTML5 app," says Rob Grimshaw, managing director of FT.com. "There's not a single thing we couldn't do in HTML5 that we could do in our native app." When the FT Web app went live a few weeks ago, the company stopped offering its app in Apple's store. The new FT site is so similar to the old native app that many focus group testers refused to believe they were on the Web. Why should developers -- and their customers -- prefer HTML5 Web apps to native apps built specifically for each device? Simplicity is one key reason. The FT made the decision more than a year ago to move exclusively to the Web, Grimshaw says. What drove the project from the start was the tantalizing promise that BlackBerry, Apple, Android, Windows, and webOS device owners could all use one single app that only needed to be developed once. Apps built natively for those operating systems are not inter-compatible, and each requires knowledge of a different programming language. All an HTML5 Web app requires is a compatible browser -- something every modern mobile device has. The robust spec even supports offline reading, a key requirement for a news site like FT.
"Developing native apps for lots of different environments was going to be a huge amount of work," Grimshaw says. "There would be an ongoing overhead for maintaining all of those apps, because we would have needed to do everything five or six times. HTML5 seemed to be the solution." ESPN had a similar motivation. Though the sports media giant has a native application for Android and Apple's iOS devices called Scorecenter, that app is just a hub for game scores and information. All other content must be accessed on the company's mobile website. Last week, that site got a makeover for touch-enabled smartphones. The new mobile site gives readers the ability to swipe left or right to scroll through top stories and touch boxes that expand to display additional information without navigating away from the Web page. "We wanted to give users a seamless experience that seems like it's been designed for the device they're using," says Jay Lee, senior director of product development for ESPN Digital Media. "With the mobile Web, we can gain a lot more scale and reach without making the same investment in each platform." But there's another big reason some developers are pushing toward HTML5: Money. Apple and Google (GOOG, Fortune 500) currently take up to a 30% cut of the revenue from app sales. Apple (AAPL, Fortune 500) wants to go even further: It wants a piece of the action on any kind of content or subscription sale made through its apps. Developers face a June 30 deadline to get in compliance, after which apps will no longer be allowed to link to external sites for purchases. That was a red flag for FT, which charges $4.99 per week for an online subscription. That fee covers access to its content on all devices. Though the FT had already made the choice to focus on the Web, it accelerated work on its mobile site earlier this year after Apple made it clear that its app store would soon come with strings attached, Grimshaw says. Others might also be drawn to HTML5 as a way to escape those strings. More than a year after the iPad's splashy debut, Facebook still doesn't have an iPad app. Though one is reportedly in the works, Facebook is also rumored to be working on an HTML5 mobile platform. Another Web Goliath has an even bigger motivation to challenge Apple: Amazon (AMZN, Fortune 500). The company is poised for a showdown with Apple over the new App Store rules, which will force Amazon to remove all links to its website from its Apple apps. That means customers won't have an easy path to go buy more Kindle e-books for their devices -- unless Amazon decides to use Apple's in-app payment system, which means giving Apple a cut of all sales. That's a mandate Amazon is very unlikely to accept. Both Amazon and Apple are staying silent about what will happen to the Kindle app when Thursday's compliance deadline hits. Amazon is also developing a Kindle application for the Web. That could give Amazon the foundation for a new, app-free approach to mobile content. A move toward HTML5 would be good news for BlackBerry maker Research In Motion (RIMM), webOS maker Hewlett-Packard (HPQ, Fortune 500) and Microsoft (MSFT, Fortune 500), which are all lagging well behind Apple and Google in the number of applications available in their app stores. But it doesn't mean all native apps will go away. The one big drawback of Web apps is that they can't take advantage of a device's hardware specifications. For instance, Web-based applications couldn't make use of the iPhone's gyroscope, the HTC Evo 3D's screen or the Motorola (MMI) Atrix's dual-core processor. Still, it's a trend smartphone makers -- especially Apple -- will be watching closely. Will Apple boot Kindle from its App Store?